When: Saturday, October 11th, 11:00 a.m. - 1:00 p.m. 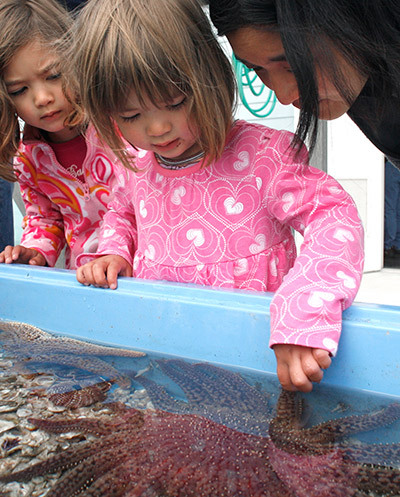 Tide Pool Survival: Touch, look, and learn about local tide-pool animals: sea stars: sea urchins, sea snails, sea cucumbers, and more! Got Seaweed? : Touch and explore seaweed & its importance in the ocean and in your home. Marine Skulls: Explore and compare real skulls and bones of marine animals! Plankton Discovery: Look at live plankton close up using a microscope. You'll be amazed by the detail! Hermit Crab Investigation: Touch and observe hermit crabs to design your own investigation to learn more about hermit crabs!